In this riveting book, Kolawole Oyeyemi brilliantly captures the mindset of a winner; revealing that anyone who sets the heart to it, armed with the right principles, can win; but at its core, Winning Mentality is about principled change, and about daring to be successful beyond your imagination, because winning is not an exception, it is a prevailing attitude. Throughout these enthralling pages, Kolawole Oyeyemi creates a stunning array of contrasts, from the lure of the world system and the dazzle of the status quo, to the raw truth about achieving good success, maintaining that you cannot win without, until you have won within. Regardless of whatever social status, irrespective of race, color, or religious persuasion, everybody wants to be a winner in life; nobody wants to be a failure! The world has different formulas for winning; a substantial amount of which are borrowed from the Kingdom of God. The Kingdom has clearly defined, heaven accredited principles for winning that when imbibed by the believer, constitutes the foundation of a God-based inner strength for sustainable victory in the battles of life. 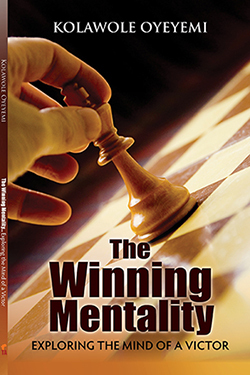 One point of agreement between the kingdom and the world is that ‘Winning is a Mentality’. If you do not have the mentality of a winner, either spiritually or physically, the possibility of living a victorious life is nil. You are a product of your thoughts. Your thought life is your real life. You cannot be greater than your thoughts! Therefore, with rare insight and passion, Kolawole Oyeyemi writes this extraordinary book, portraying practical bible based principles for winning; which makes Winning Mentality more than a book; it is a piece of life.